Through funding from the Royalties for Regions program the Boab Network has been able to set up a Community Resource Centre in the community giving the people access to computers, tablets and the internet. This has allowed access to banking, Centrelink and other government instrumentalities for adults and to on-line learning and social activities for all community members. Boab Network volunteers with the requisite skills have assisted the community to access funding to allow the employment of a deputy CEO to assist with the huge administrative load. They are also assisting the community with issues around housing, maintenance, Art Centre administration and governance. Vegetable gardens have been set up at the suggestion of a local elder and all community members encouraged to participate in growing and enjoying fresh vegetables. The success of the gardens has waxed and waned depending on the enthusiasm of the current caretakers. This project is waiting for a keen gardener to take it in hand and rejuvenate it! The Boab Network has promoted and developed its support of the Mowanjum culture through their support of the annual Mowanjum Art and Culture Festival and by organising regular trips back to the people’s traditional land. Administrative and practical support for the festival has assisted the local people to present a world class event showcasing their colourful culture and instilling a respect for and knowledge of culture in their children and young people. Regular trips back to traditional lands have assisted the elders to maintain their close spiritual ties to the land and to aid the transfer of cultural knowledge to the young people. These camping trips have encouraged the formation of strong friendships between Mowanjum people and Boab Network volunteers and given volunteers the opportunity to learn from the vast wealth of bush knowledge of the Mowanjum people who have been generous in their sharing. 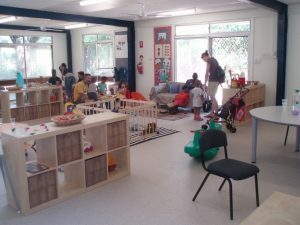 In 2014, the Boab Network renovated an old ‘donga’ and established the Early learning and Parenting Centre with funding from the Department of Prime Minister and Cabinet to employ, Gail Cresswell a qualified Montessori teacher. The centre involved young children in the first three years of life in a Montessori style learning environment in the centre of their community. The centre thrived and was a hub of enthusiastic activity for fifteen months before the government funding was discontinued and the school was forced to shut. Eighteen families were involved in the initiative and it was judged an unqualified success. All funding ceased in 2015. Fortunately Gail was appointed by the Education Department to run the nearby Mowanjum’s Pre- Year 1 School in the Community. Involvement with the justice system is so common in the lives of many aboriginal communities that it has become almost a rite of passage for some. In view of the high rate of offending within the young population of Mowanjum this program was embraced as a potential route by which young people from the community may be exposed to material which might assist them to make better choices in their lives and thereby, ensure a better future for themselves and the community. 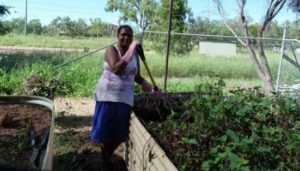 The program, run by Robert Watson from Gulbujargu, and organised and supported by the Boab Network has been funded by grants obtained by the Boab Network. Arguably, the greatest achievement to date has been the exchange of cultural learning between Mowanjum and Boab Network folk and has underpinned the development of firm friendships and a trusting relationship. The Ashley St Centre was a run-down building in Derby which had been used as a sobering up centre for local residents until it was“discovered” by Ross Gobby, John Tyrrell and Keith Bakker. They were looking for a building that could be used as a school for young girls who would otherwise have dropped out of school after having babies in their teens. It was felt that if a location could be found where the girls could continue their education away from the main school, they may be willing to remain engaged with the education system. As it happened, the building was already owned by the Derby Senior High School and so began a very productive relationship between the school and the Boab Network. After many discussions with school personnel and community elders, the building was extensively renovated by Boab Network volunteers, John and Keith, during a long hot summer in Derby and the house was redeveloped as a centre for teen mums where they could continue their education whilst accessing services provided to themselves and their babies by a range of community services in the fields of health and education. 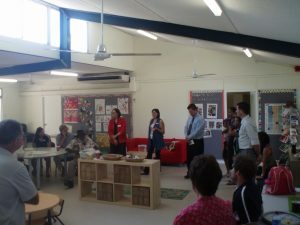 There were many unique features of the Ashley St Centre including the coordination of services to come to the clients instead of relying on the young mums to come to them. This maximised positive outcomes for the mothers and their babies.